Applebees Triple Chocolate Meltdown has to be one of my favorite desserts that were recently served at Applebees. You can recreate this chocolate molten cake at home. Who doesn’t love chocolate? Well, there are a few people that dislike chocolate, to be honest, and I feel sorry for them. For the rest of us is a chocolate!! 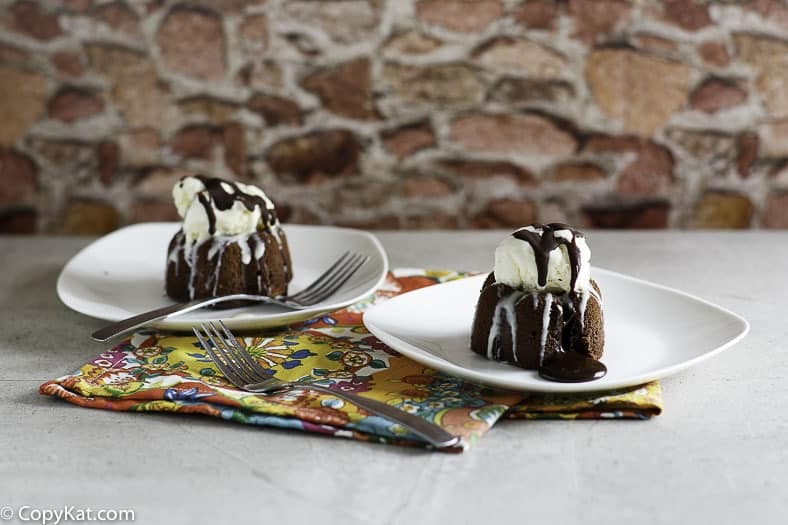 This recipe is wonderful but if you like a plan chocolate melting cake, you should try my Carnival Cruise Ship Molten Lava Cake. The Applebees Triple Chocolate Meltdown cakes have a great layer of chocolate flavors. First, you have the chocolate molten cake, but then we top it with a layer of thick chocolate sauce, and we also layer on a white chocolate sauce layer. So this chocolate recipe has a little something for everyone. The ingredients are very basic for this recipe. You will need both semisweet chocolate and some white chocolate. You will also need some sugar, eggs, flour, and some vegetable shortening, so the ingredients are very simple. This recipe isn’t difficult to make, I know when you try making this style of chocolate cake you are going to want to make more of the melting/molten lava chocolate cakes. I do recommend one tool if you do not have it. For this recipe, you should use 6 ounce ramekins. The ramekins are very helpful. I don’t recommend pouring the batter into a small cake pan, and cooking it, while you could do it, you won’t get the lovely visual of individual desserts. If you love recipes from Applebees, be sure to check out my copycat recipes. Recreate this luscious chocolate dessert at home. Preheat oven to 400 degrees. Butter 4 small (6-ounce) ramekins or other small ovenproof dishes, then dust with sugar. 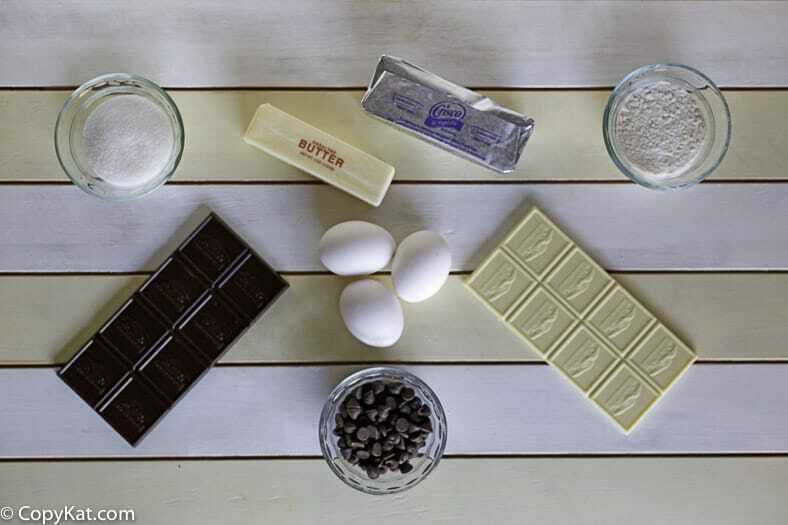 In the top of a double boiler over simmering water, melt the 4 ounces chocolate chips with 4 ounces butter. Wisk occasionally until smooth and uniform. Meanwhile, whisk together the whole eggs, yolks, and 1/4 cup sugar until light and fluffy. Pour the melted chocolate mixture into the egg mixture and stir very quickly. Add the flour and salt and blend until just mixed. Prepare the ramekins by buttering them on the inside thoroughly and dusting with sugar. Pour into prepared ramekins. Set the ramekins on a baking sheet and bake for 8 minutes, the cake centers will still be soft. Invert each chocolate lava cake onto a dessert plate. They will slip out of the ramekins in a few seconds. To make the drizzle toppings, place the white and semisweet chocolates in separate bowls and add 1 teaspoon shortening to each bowl. Melt in the microwave for 15-second increments: microwave the chocolate stir and microwave again until fully melted. 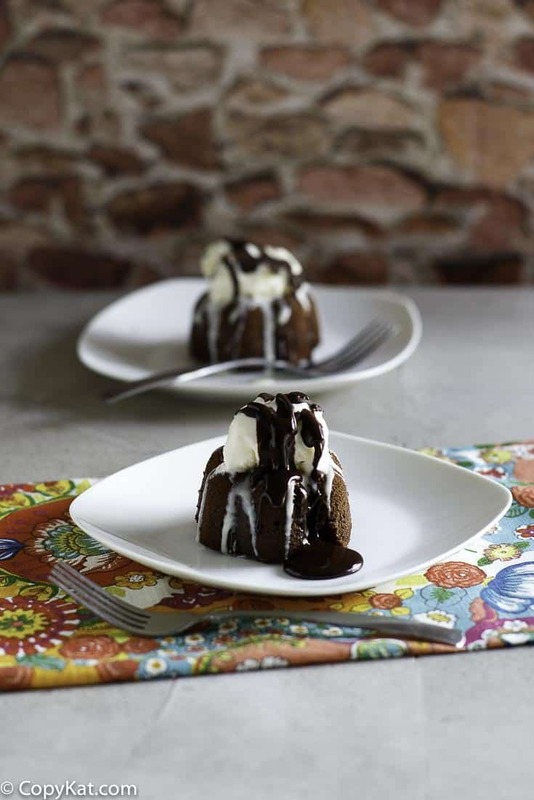 To assemble the desserts, top each lava cake with a scoop of ice cream. Drizzle the white chocolate over the cake and then drizzle the semisweet chocolate over the lava cake. The cake looks delicious. I like this kind of cake. Sometimes calories just don’t matter, chocolate desserts fall into this category. I have never had this cake at the restaurant but I am obsessed with LAVA cakes.